Snippets of Jack: "Idiot. He has nowhere to go but back to the noose!" "Idiot. He has nowhere to go but back to the noose!" After some interesting altercations with the British Navy, Jack Sparrow is captured and is preparing to be hung, Will Turner is wearing some crazy hat and Elizabeth Swann (Turner) is engaged to James Norrington. My oh my what a great opportunity to embarrass some one and escape death! 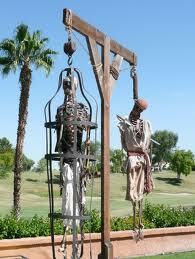 Jack is all ready to be hung and is being read his charges;"Town Clerk: Jack Sparrow. 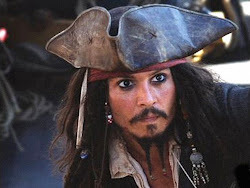 Jack Sparrow: Captain... Captain Jack Sparrow. Governor Swann: Commodore Norrington is bound by the law, as are we all. Jack Sparrow: Oh yeah, heh heh heh" All of a sudden Will shows up in his hat, and a parrot we all know flies by. Hmm something must be going on....right? Well of course! The trapdoors under the gallows drop out and Jack is hanging between life and death but good 'ole Will throws his sword for jack to balance on and saves his partners life. but come on the area is surrounded by the Royal British Navy and there is know way out. But oh wait what about that Elizabeth girl? Right on time she springs into action and "faints" distracting her fiance for just the fight amount of time, and Jack forms a plan. And of course it works. He And Will end up unsurrouned by Royal Navy officers and prepare to jump off the cliff but they can't leave with out jack having his final word. "Well, I'm actually feeling rather good about this. I think we've all arrived at a very special place, eh? Spiritually...Ecumenically...Grammatically? I want you to know that I was rooting for you, mate. Know that. Elizabeth. It would never have worked between us darling...I'm sorry. Will...nice hat. Friends. This is the day that you will always remember as the day that—[Falls off]"
And so the trio lives to pirate another day.